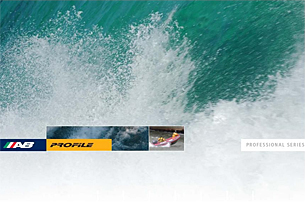 AB INFLATABLES, a division of AB Marine Group, is world renowned as the premier designer and manufacturer of inflatable boats for both the leisure and professional markets. AB INFLATABLES has a long established reputation for innovative design, superior construction and outstanding customer satisfaction. The company’s boats have earned their status as the world’s finest inflatables. AB INFLATABLES is one of the few RIB manufacturers holding CE as well as NMMA certification. To the company, attention to details is of the utmost importance. AB travels the world to procure the finest materials available and painstakingly hand-crafts each boat, to ensure that even the smallest details are considered. The result is a full line of inflatable boats, designed and built to provide customers with the exceptional quality they deserve and have come to expect from AB. The company is committed to meeting the ever changing needs of customers. It is this commitment that drives AB’s almost constant innovation. The company has never shied away from the hard work of refining the existing models, designing new craft or retooling its workshop to ensure that AB boats are truly the most celebrated watercraft on the market. This unequaled pursuit of perfection has long distinguished AB from the competition. With nearly four decades of proven expertise, AB INFLATABLES has earned its reputation for excellence. The company’s unparalleled craftsmanship, relentless innovation, and commitment to customer service have made the entire AB line the most prestigious and sought after inflatables on the market. The company exports to USA, the Caribbean and Europe. 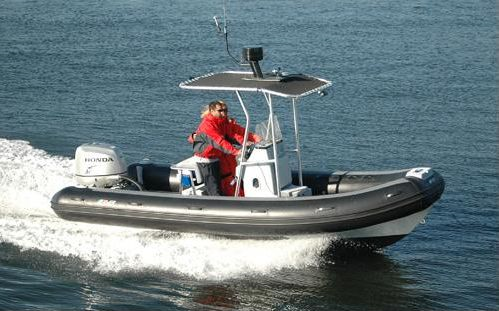 AB’s Profile line of rigid inflatable boats are designed and manufactured specifically to meet the demands associated with commercial and industrial use. 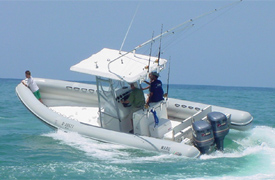 These boats are built with an unparalleled quality to provide clients with the most durable and dependable watercraft possible. The versatility and ease of customization of AB’s Profile boats make them the ideal vessel for a wide array of professional applications. By design, AB boats provide far superior maneuverability over traditional hulls, offering unequaled performance and safety. Profile’s large diameter tubes combined with deep-V fiberglass or aluminum hulls provide an extremely stable, dry and safe ride. As evidence of AB’s high quality, the company is one of only a few RIB manufacturers that have CE as well as NMMA certification. 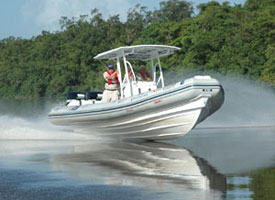 The product range includes Open Aluminum Boats and Console Fiberglass Boats. The Profile A Series aluminum hull professional RIB has just what fire and rescue authorities are looking for. The Profile A Series are extremely lightweight, yet rugged, making the boat easily transportable should it need to be carried in order to launch. Also, relatively small horse powers are needed to plane with multiple passengers onboard. Its aluminum hull is less vulnerable than fiberglass to the damages that may be caused by shallow, rocky shores and beaching. The exterior features a double rubrail, and the multiple chamber tube is constructed of heavy-duty, commercial-grade 1640 denier Hypalon/Neoprene fabric. Several heavy-duty handles make it easy to carry and manoeuvre through rough terrain. AB INFLATABLES has a long established reputation for innovative design, superior construction and outstanding customer satisfaction also in the leisure/high performance market, where it offers a whole range of products that have CE as well as NMMA certification and that includes Open Boats and Console Boats. 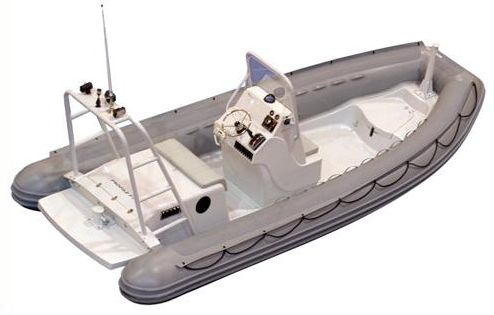 The MACC 19 by AB INFLATABLES, is a new high performance adventure boat built to military and commercial standards. The heavy duty deep "V" hull allows for remarkable speaks and maneuverability while the tubes are made of extra thick 1670 denier Hypalon material for added safety. Larger inflatable boats and oversized tubes do not necessarily offer more interior space or better performance. Long and pointed cones at the rear of the tubes and the indenture of the transom mat seem to increase the length of the boat, but this does not necessarily mean more interior space. Over sized tubes not only reduce internal room, but also affect the performance and appearance of the boat. 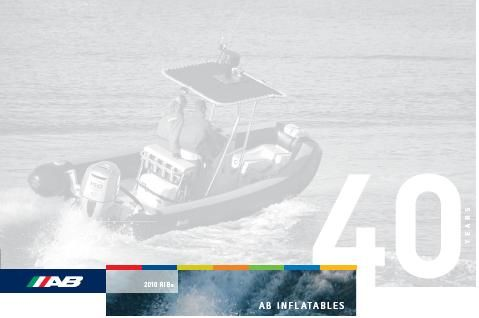 AB INFLATABLES balances the sizes on all of its boats, along with the diameters and internal, usable space in them, allowing for the greatest internal area-to-length ratio in the inflatable boats market. AB INFLATABLES manufactures both fiberglass and welded aluminium rigid hulls. 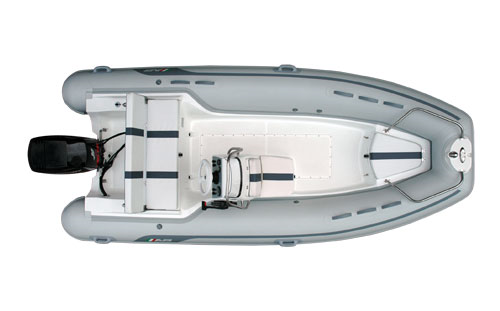 All the company’s fiberglass RIBs are double-molded and hand sealed to provide an airtight, underdeck compartment. AB’s distinctive raised bows and layered, deep-V design add seaworthiness and provide the driest ride on the water. Each AB inflatables boat is carefully designed and crafted to plane easily without excessive power. When weight and durability are important factors, AB is the best choice because each model is meticulously engineered to be as light and tough as possible. Customers can verify this toughness themselves by standing in any of AB’s RIBs as they lie on a hard surface. Even the smallest RIB has internal stringers that add strength, rigidity and durability to the structure, a feature that makes them very popular as dinghies for charter companies throughout the Caribbean. All tubes on AB INFLATABLES boats are hand-made with Pennel Industries' Orca® fabric (hypalon-neoprene®) and overlapped a full inch (2.5 cm), with taping on the inside. Superior craftsmanship and the highest quality materials make AB’s round tube ends neat, and they are finished with a rub rail that extends around the ends to protect the stern of the boat. The company uses large tubes for each boat to improve safety and seaworthiness, increase payload capabilities and a dry ride. Another example of how AB INFLATABLES makes the extra effort to manufacture a better boat is that each tube has a minimum of three air chambers, divided by a special baffle system to equalize pressure. In addition, each tube is sized proportionately to the boat's hull dimensions, so customers get the best ratio of boat length and weight. 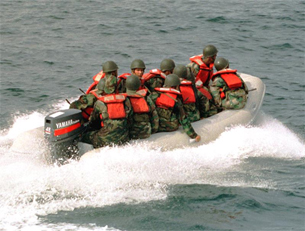 The most important element of an inflatable boat, is the fabric used in its manufacture. That is why AB INFLATABLES has chosen Orca® fabric (hypalon-neoprene®), manufactured by Pennel Industries, the leading European rubber materials manufacturer. During the last 75 years, Pennel Industries has developed durable, eye-appealing fabric for the marine industry. Their products conform to the highest standards, having obtained various certifications by European and International organizations. 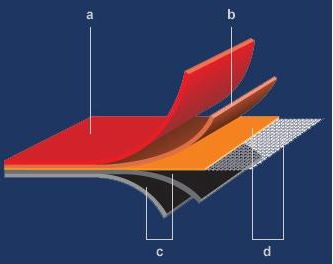 Air tightness (no air in the high textile). Thanks to its intensive research and advanced technology, in 1996 AB INFLATABLES introduced its revolutionary fibreglass floorboards that are maintenance free. These floorboards come standard with anti-skid finish for enhanced safety. Reinforced aluminium battens make up the framework of the floor structure providing the utmost in rigidity, and once again, no maintenance. Also standard, double-moulded fibreglass transom and removable double-moulded fibreglass rowing seat.